'If anyone can help us break our longstanding bad eating habits, it's Shira' GWYNETH PALTROW'The Food Therapist is a must-read for anyone who wants to change their eating habits but can't seem to make the shift. Shira makes it relatable and totally doable' LAUREN CONRAD We've all been there. We treat ourselves to some decadent dessert but don't take the time to enjoy it, and then quickly kick ourselves for it. Or we go on a super restrictive diet to only feel incredibly guilt-ridden after splurging on something we shouldn't have. When it comes to food, we are our own biggest critics, and this relationship can become very complicated. In THE FOOD THERAPIST, popular nutritionist Shira Lenchewski, reveals the root cause of our emotional hang-ups around food and our bodies in order to make conscious eating and lifestyle choices that serve achievable goals. 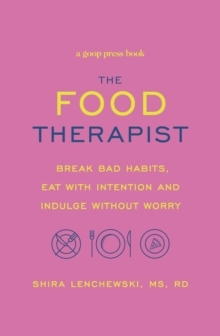 Filled with unintimidating, nonjudgmental, and easy-to-execute practices as well as food hacks and simple meal plans, THE FOOD THERAPIST will change your relationship with food into a positive one.